Wilson Mak heads to Singapore and takes a seat at Paradise Dynasty restaurant for some uniquely colorful Xiao Long Bao dumplings. short trip to Singapore, Paradise Dynasty became my top list to visit. I went to Paradise Dynasty for a dinner with my family on a weekday night and to our surprise, there was already a big lineup outside the restaurant. It took us about an hour before we got seated. 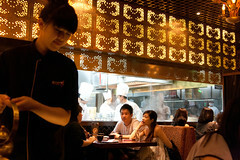 As we entered the restaurant we could see an open kitchen with several chefs making hand-pulled noodles and dumplings. The interior was pretty posh for a Chinese restaurant. Located inside ION mall, Paradise Dynasty was well-received by the locals due to it’s food quality and decent price. We ordered a tray of the 8 flavored xiao long bao, two bowls of hand-pulled noodles and desserts. Some of the flavored xiao long baos did stand out ( the ginseng, the black truffle, the original and the szhechuan ) in terms of flavour, while the others had a pretty subtle taste. The overall quality of the xiao long baos in Paradise Dynasty, however, was as good as, if not better than, Din Tai Fung or Crystal Jade. 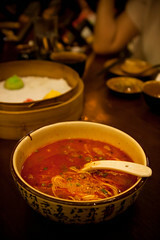 Aside from xiao long bao, the hand-pulled noodles was also the highlight of the restaurant. Just by looking at the chefs pulling the noodles at the open kitchen already made the dinners tempted to order and try. The dan dan noodle ( noodles in spicy peanut sauce ) and the Zha jiang noodles ( sautéed noodles with minced pork ) were great. 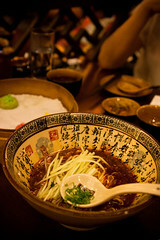 Both bowls were very flavorful and we really enjoyed the texture of the hand-pulled noodles. 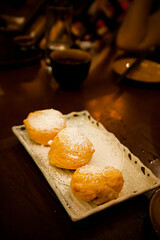 I never had soufflé egg white balls stuffed with red bean and banana before and I found this dessert pretty interesting. I liked the fluffy texture of the soufflé and the red bean and banana combo was just perfect. 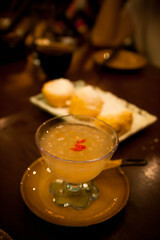 Our second dessert was the chilled Aloe Vera and Osmanthus Jelly in honey lemon Juice. This was one of the most refreshing desserts I’ve ever had. The combination of the ingredients were very aromatic and refreshing.